Girls and pearls. They go together like cheese and wine, like Romeo and Juliet. 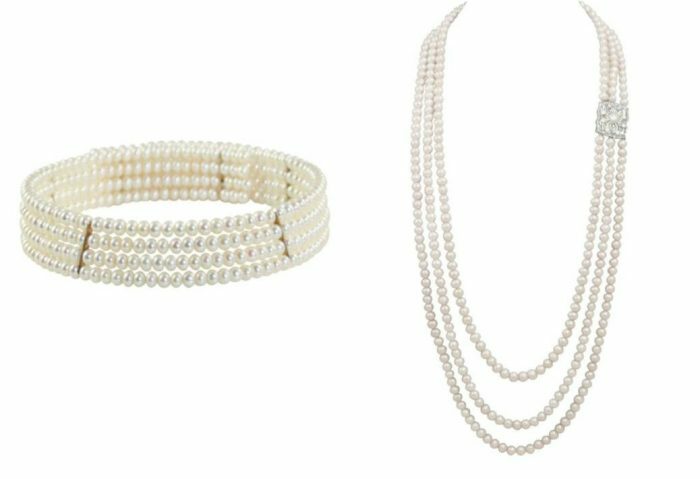 Lately, pearls have seen a resurgence in popularity thanks to some of the world’s best-loved young celebrity ladies who have taken a shine to these stunning gems. 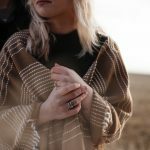 No longer considered old fashioned and forgotten, pearl necklaces, pearl earrings and embellishments are back at the height of jewellery fashion trends. Let’s take a closer look at how today’s lovely leading ladies are wearing their pearls; you might even find some style inspiration of your own. Starting with everybody’s favourite female royal, HRH Catherine Duchess of Cambridge looks like she was simply born to wear pearls. 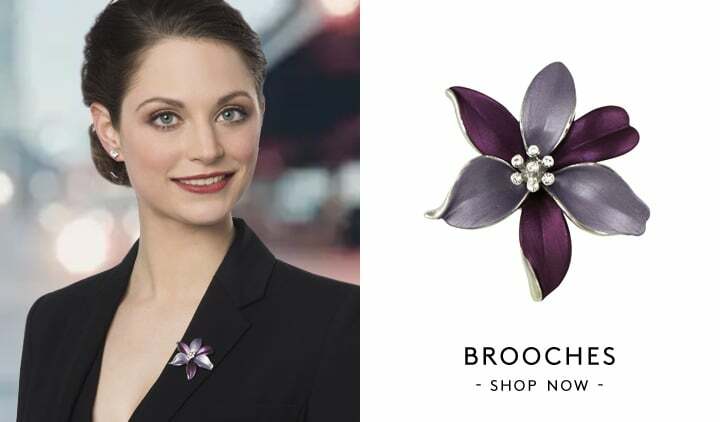 Ever associated with elegance and grace, pearls are the perfect gem for this most graceful and stylish of ladies, and we love the subtle way in which she likes to show them off. 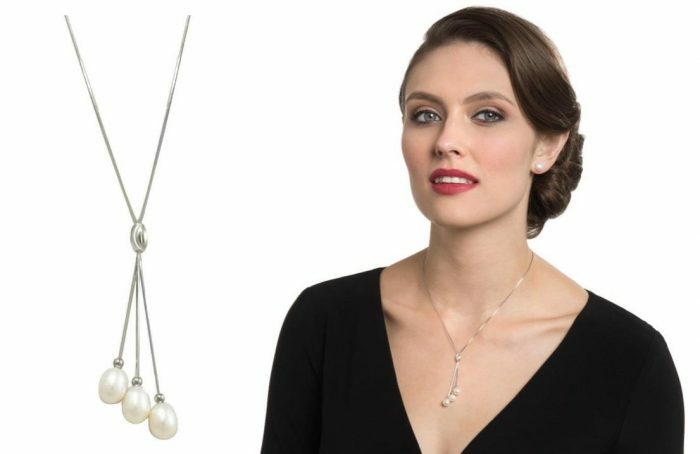 We especially love her multi-pearl drop pendant necklace on the left, which creates a wonderfully contemporary look while retaining the pearl’s classic elegance. Scarlett Johansson truly is The Girl With the Pearl Earring … and the pearl necklace, and the pearl skirt, and the pearl everything. 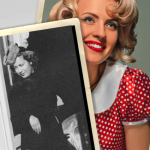 It’s no secret that this stunning actress really loves pearls, and we don’t blame her. Whether she’s sporting a multi-strand choker/lariat hybrid necklace or posing for glamorous Russian Vogue shoots wearing amazing pearl-encrusted skirts, we think you’ll agree that she looks right at home in these beautiful gems. Pearl-embellished clothing is growing in popularity with each new season that passes, with everything from subtle pearl detailing on shirt collars to jackets and skirts completely covered with them all available to buy online. Love Scarlett’s multi-length pearl necklace? 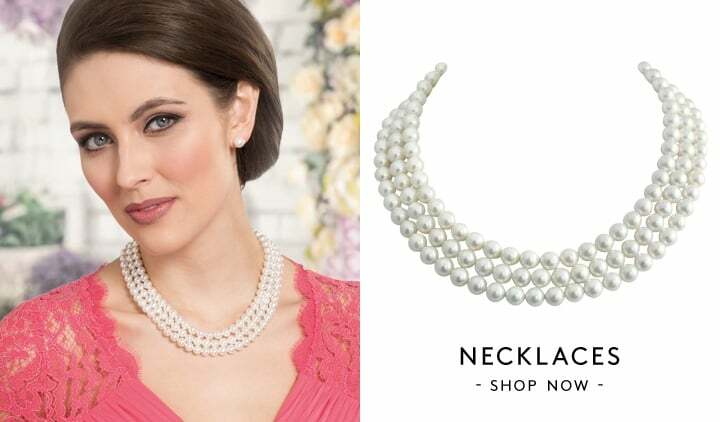 Try pairing up our Princess Freshwater Pearl Choker and our Bossanova Triple Strand pearl necklace to achieve this effortless layered look just like Scarlett. 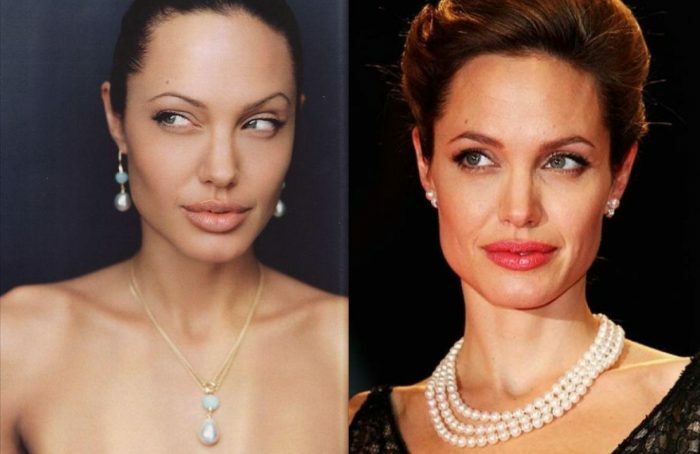 Angelina Jolie is known and loved around the world for her elegance and sense of style, and we love her even more for her exquisite taste in pearl necklaces and earrings. 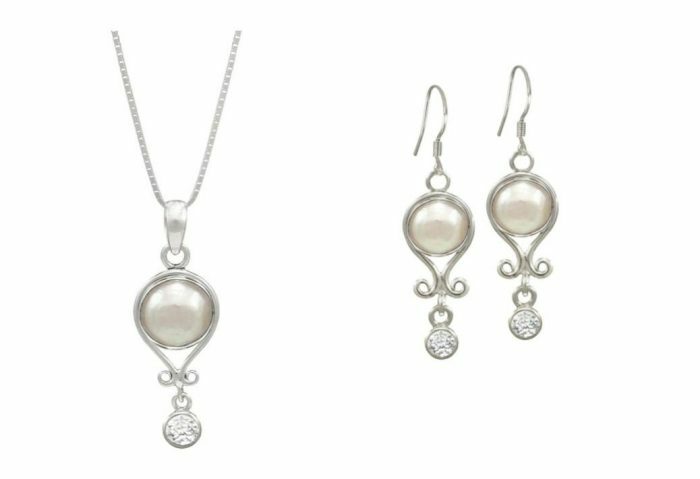 She pulls off all types of pearl with effortless grace, and we especially love her matching set of peardrop pearl pendant and pearl earrings, beautifully designed in a double-stone drop style. 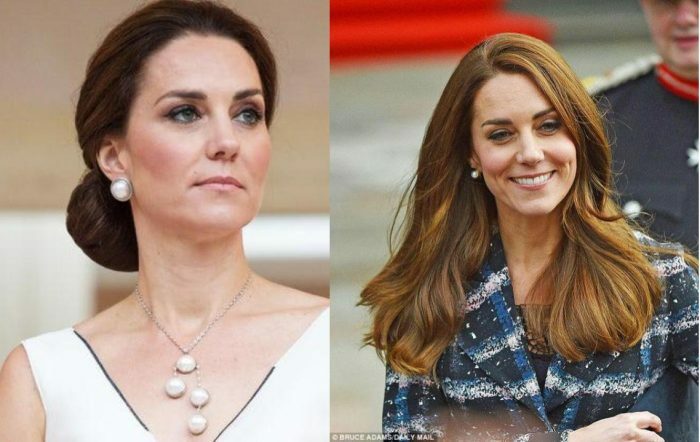 Just like Kate Middleton’s modern pearl necklace, Angelina’s jewellery strikes the perfect balance between traditional pearl jewellery and contemporary style. 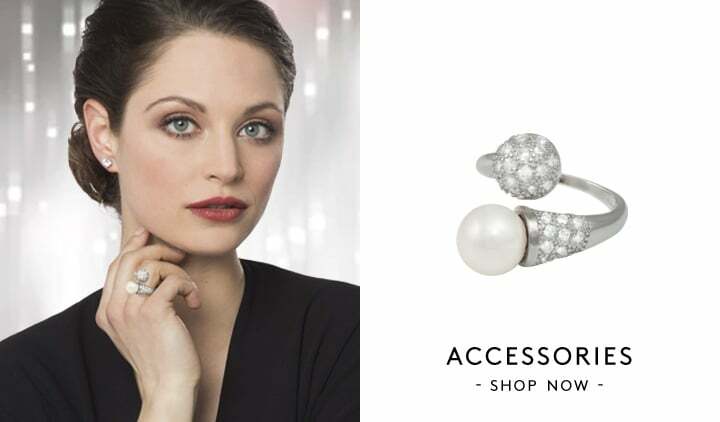 Love this pearly pairing as much as we do? 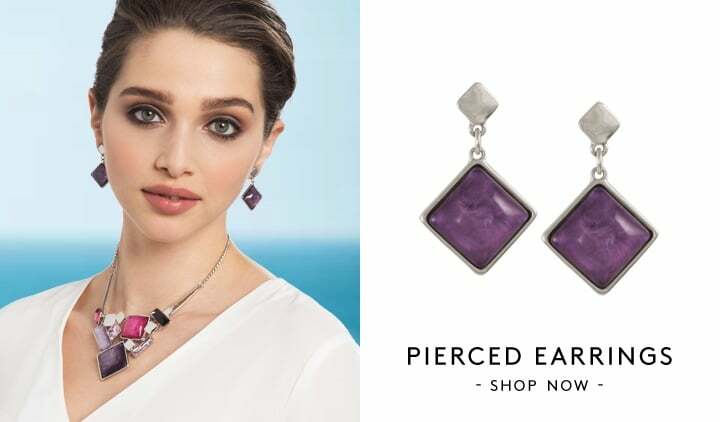 Achieve a similar double-stone look with our beautiful April Quartz and Pearl sterling silver pendant with matching April Quartz silver pearl earrings. 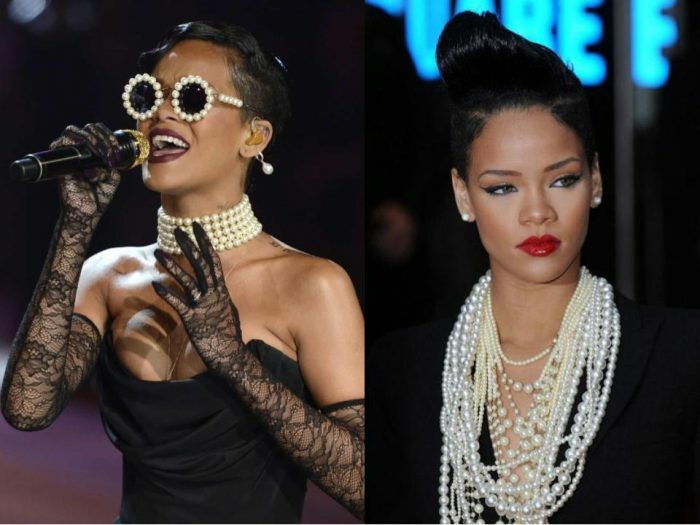 When Rihanna walked on stage at the Victoria’s Secret fashion show back in 2012 in pearl sunglasses and 5-strand pearl choker, the world fell in love with pearls all over again. 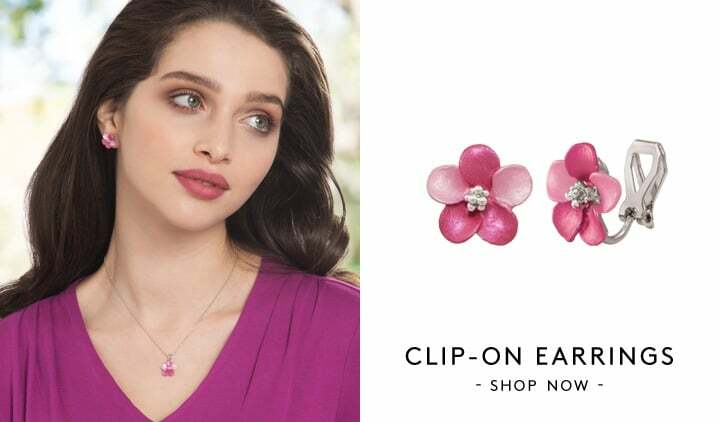 This iconic singer, already famous for her fashion sense, has been dazzling us with her statement pearls for over a decade and we love her creativity with these versatile little water gems. 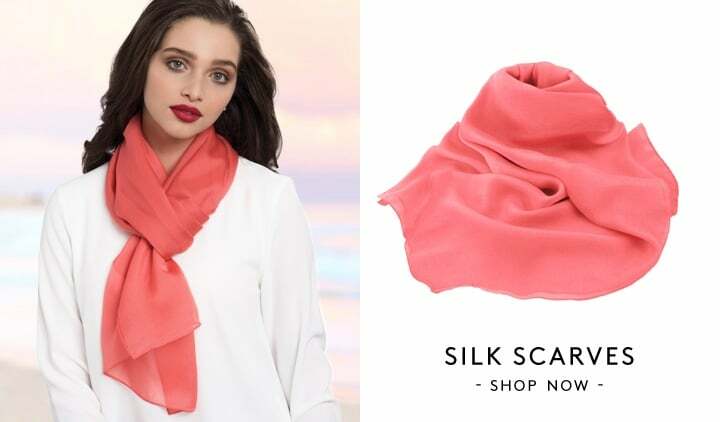 On the right-hand image she can be seen creating a truly standout look by layering strand after strand of pearls of different sizes and shades, all layered on top of a plain black outfit. This is sheer fashion genius, as the pearls become the star of the show, not the clothing. Love the layered look? You can easily recreate this by building up strands of your favourite pearls in different lengths and sizes. 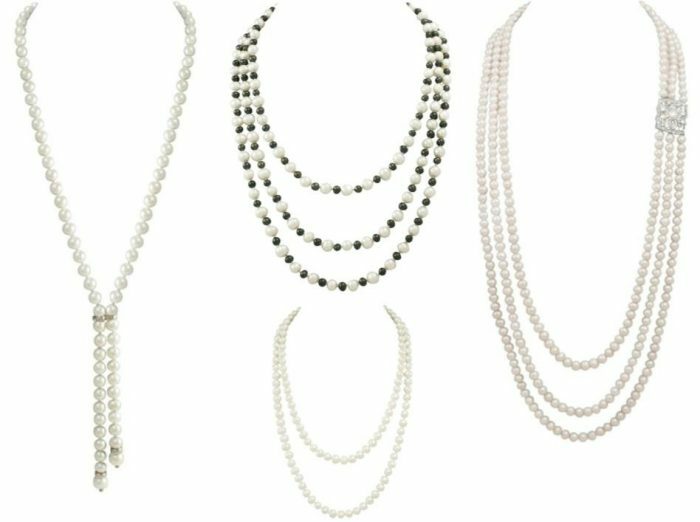 Try layering up our Bossonova pearls from earlier in the post with the Connoisseur White Freshwater pearl necklace, the Sloane White South Sea Shell Lariat necklace, and the Amity White and Black Peacock Freshwater pearl rope necklace for a great mix of lengths, pearl sizes and colours. We hope you’ve found plenty of incredible pearly inspiration from these lovely ladies; we certainly have. For even more inspiration take a look at our latest collections of pearl necklaces and pearl earrings here at Eternal Collection.